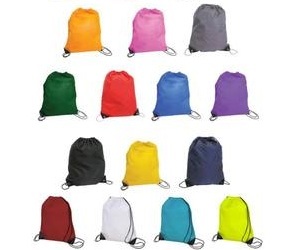 Large Drawstring Sports Bag - Express Corporate - Promotional Products - Delivered Fast! Nylon 210D Tote/Sports Bag with drawstring and simulated leather reinforcement in black at corners. A great quality value bag for any event. Quantity Discounts Please call our sales team for fantastic discounts on higher quantity orders!